It is now a decade since the U.S.-European Cluster quartet of satellites began their mission in space - a good time to review the results of a programme dedicated to the sometimes turbulent Sun-Earth relationship. Aurora borealis over Canada detected by Cluster in 2007. Credits : Canadian Space Agency/ University of Calgary. Cluster is in fact a constellation of 4 satellites. Flying in pyramid formation, Samba, Tango, Rumba and Salsa are thus able to track in 3D and in real time the flow of charged particles continuously streaming from the Sun that buffets Earth’s protective magnetic sheath. Since 2000, Cluster has mapped different regions of Earth’s magnetosphere and shed new light on a range of scientific questions. 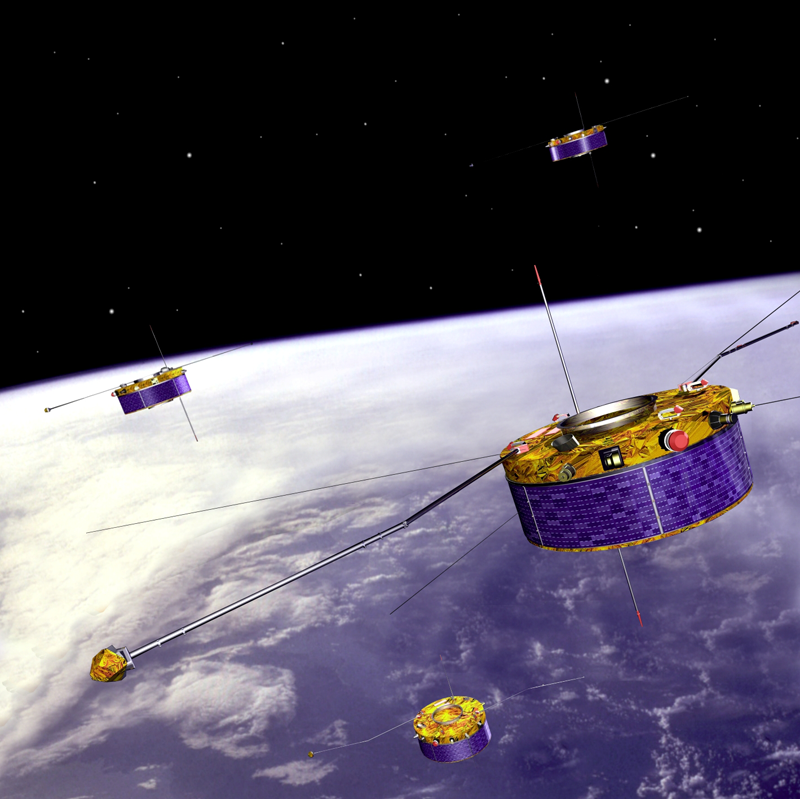 The Cluster satellites in orbit since August 2000. Credits: Ill. ESA. Interaction between the solar wind and Earth’s magnetosphere. Credits: SOHO/LASCO/EIT. NASA. ESA. 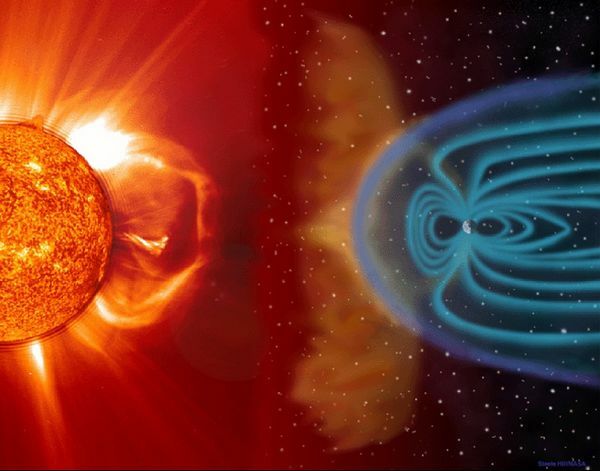 For example, Cluster’s discoveries have brought fresh insight into “surface waves” generated by the solar wind inside Earth’s magnetic field, and into the phenomenon of “magnetic reconnection” that occurs when solar flares hurl huge discharges of energy toward Earth. Indeed, the Sun’s sometimes violent moods produce geomagnetic storms in the vicinity of our planet. These result in the magnificent displays of aurora borealis, but can also damage or disrupt telecommunications satellites and terrestrial power grids. 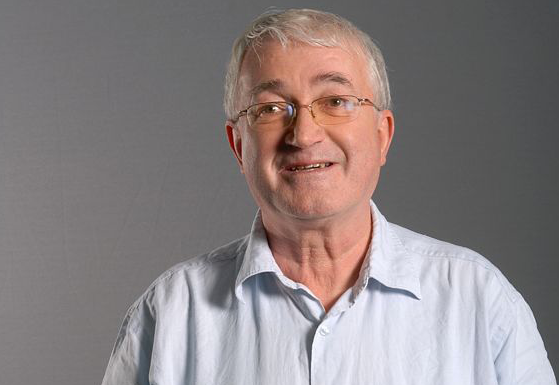 Jean-Yves Prado, Cluster Programme Manager at CNES. Credits: CNES/E. Grimmault. Using the data amassed by Cluster, scientists hope to refine their models of space weather and be able to forecast solar storms a few days ahead. The Cluster mission is set to continue to 2012, possibly 2014. In that time, it can be expected to tell scientists still more about the Sun and Earth’s sometimes turbulent relationship.